User-generated content isn’t quite as exciting a concept as it used to be. Perhaps releasing four LittleBigPlanet adventures (and one kart racer) in five years watered down the uniqueness of it all. Or perhaps it was Minecraft, arguably the biggest video game in the world, with its massive community of crafters and world-builders constantly one-upping each other. Whatever the case may be, the bloom has definitely fallen off of the “play, create, share” rose that was once Sony’s mantra. The newly released LittleBigPlanet 3 offers a whole lot of bigger and more robust tools for creating a player’s dream stage. This newest game makes it easy to reverse gravity on a whim or explode any object into a hundred pieces. It gives players more agency, allowing them to climb, fly, teleport, and shrink through any obstacle course they dream up. What it doesn’t offer is a compelling game to demonstrate those tools the way the series has in the past. The lasting appeal of LittleBigPlanet has always been its community—what mad science they practice to produce their own wild adventures—but the foundation is an on-disc campaign full of excitement and wonder. The grappling hook in LittleBigPlanet 2 was never a utilitarian means of transport so much as it was a joyous display of former developer Media Molecule’s famous rag-doll physics, setting off elaborate Rube Goldberg setups of levers and pulleys that made its handcrafted world spring to life. It was easy to go on those adventures and think, “Wow, this is neat. Now let’s make it better.” This newest installment has a whole lot of new toys, but no imagination in how to play with them. It’s hard not to pin the blame here on Sumo Digital, taking over lead design responsibilities from Media Molecule (and Double Eleven and Tarsier on the excellent Vita installment). Sumo has done fantastic work on other series, and what little game there is here is certainly competent. 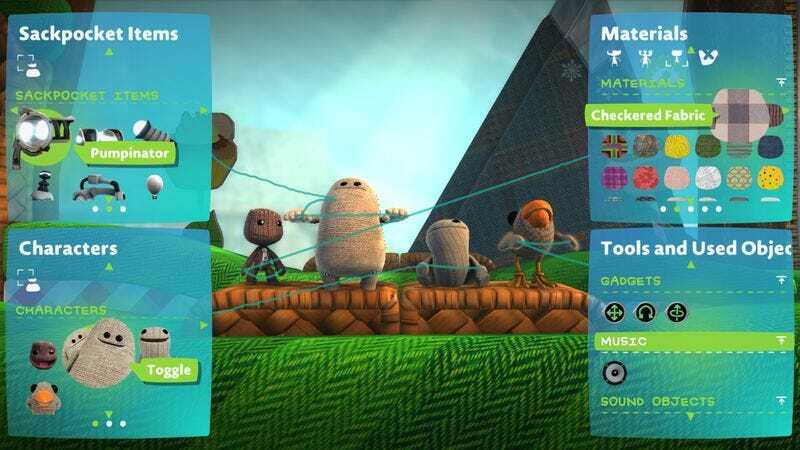 However, it lacks the exuberance and discovery that’s at the heart of LittleBigPlanet. It’s missing those wondrous moments where something outlandish pops up and players are left wondering, “How did that happen?” before realizing they have the tools at their disposal to recreate that moment and expand upon it. Despite all the bells and whistles, LittleBigPlanet 3 never ignites itself in celebration. Instead, the campaign tries to become more “game-like” than past installments. Hub worlds and in-game currency are introduced, each one an exercise in tiresome bauble collecting and uneventful exploration. The entire adventure is voice acted, not just the cut-scenes, which raises production values but eliminates the feeling that all of this is taking place within a patchwork diorama. These all sound like perfectly reasonable upgrades, but they clash with the hand-crafted pastiche LittleBigPlanet was built on. This might as well be any other platform adventure game. The one vast improvement here is in the world-building tutorials, which take place on a whole separate planet of missions called “Popit Academy.” While past LittleBigPlanet games would simply play a video of Stephen Fry narrating how to use each tool and leave it up to players to try on their own, Popit Academy presents a series of levels where each material and technique is explained and practiced in sequence in order to progress through simple challenges. Can’t cross that pit of spikes? Better build a piston to create a moving platform to the next stage. It’s a “show, don’t tell” approach to learning that gestates a greater sense of familiarity and comfort with the complex tools in the hopes that players will create their own dream stages to share with the world. Unfortunately, for a game all about creativity and innovation, its ready-made content sure does feel derivative. The “velociporters” and “blink ball” both function as surrogates for the portal device from Valve’s Portal games, and localized gravity fields feel exactly like the 2-D sections of Nintendo’s Super Mario Galaxy. Even the foreground/background divide created by the game’s 16 planes of stage depth only allows for two parallel planes that players can bounce between, a feat that was repeated to exhaustion in Kirby: Triple Deluxe. Each of these tools could be used for countless other purposes, but the examples provided for players feel more like mash-up fan fiction. These are the sorts of levels one might expect users at home to make, not professional game designers hoping to inspire their audience with something new. With an almost staggering variety of new creation tools and a whole new training area designed to teach about them, LittleBigPlanet 3 is clearly a game with creators in mind. Those tools alone cannot justify the price of admission, though, and the package that accompanies them lacks the series’ signature imagination. Practicing on imitation instead of innovation, this is the type of game a focus group might have decided LittleBigPlanet should be, rather than the game a joyous crew of creative thinkers would have decided the game could be.